While it may not be Rio, the Buffalo State campus is evoking a definite Olympic vibe as the college celebrates its 2016 Weeks of Welcome (WOW). 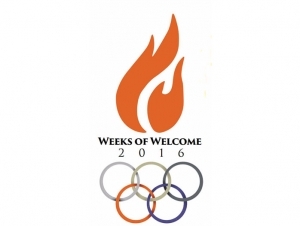 Organized by the Student Life Office, Weeks of Welcome: Going for the Gold is composed of a host of informational seminars, receptions, films, dinners, athletic events, parties, and more designed to acclimate students during the first six weeks of the fall semester. The first week of WOW, held August 23–28, aptly named "Opening Ceremonies," included a trip to Niagara Falls, a movie night, and a welcome back barbecue. Activities during the week of August 29–September 5 follow the theme "Social Engagement" and include a trip to Coca-Cola Field for a Bison’s game, a cultural festival on campus, dinner at the Newman Center, and a football game at Coyer Field. WOW will continue with "Academic Excellence," September 5–11; "Community Engagement," September 12–18; "Homecoming," September 19–25; and "Civic Engagement," September 26–October 2. During these weeks, various offices around campus will hold workshops on important elements of college life such as effective notetaking; United Students Government representatives will help students get involved; and students will be introduced to the cultural offerings on campus such as exhibits at the Burchfield Penney Art Center and the Dare to be Diverse film series. Students also will be encouraged to get involved in the community event such as the “Out of Darkness” Suicide Prevention Walk and they will get a taste for leadership opportunities. Another focus this year is on engaging new and returning commuter students, which comprise about two-thirds of the student body. During the first Bengal Pause of the semester, Student Life will host a Commuter Welcome Back in the union lobby. And on Tuesday, September 6, there will be a Commuter Connections Breakfast from 8:00 to 10:00 a.m. in the union’s Fireside Lounge. This gathering for commuters will continue the first Tuesday of each month throughout the school year.